I really don't know where the last 6 months has gone. It's definitely been the quickest 6 months of my life. So much has changed, life is certainly very different. And I wouldn't change any of it for a moment. Punky is just about the best thing that has ever happened to me and I couldn't imagine life without her. I don't know what we used to do before she came along. *She's growing and developing rapidly now. *She reaches out and grabs anything that comes even a little bit close to her. Especially my hair! *She rolls all around the loungeroom, over and over. *She can turn 360's on her stomach, looking for the next best toy. *She's desperate to crawl. She gets up on her hands and knees and sways backwards and forwards, just not quite sure how to actually propel herself forward. *She got her first cold last week (and still has it! 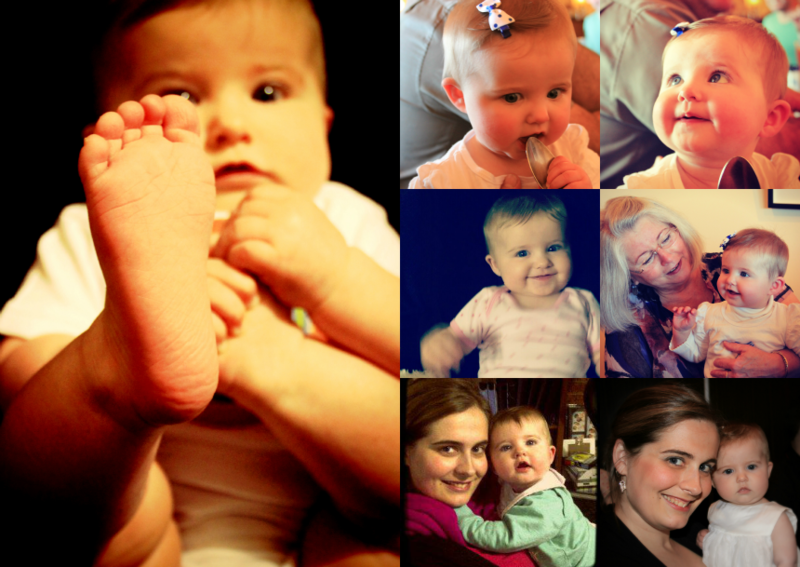 ), just 2 days shy of her half-year birthday. We almost made it 6 months illness-free! She's very generous with her germs, I have her cold now too! *She brings so much joy to everyone in her life. Her Aunties spoil her, her grandparents can't get enough of her, and she has her Uncles wrapped around her finger! I wish I had of done the photo with the month on the onesie for our kids, love it!